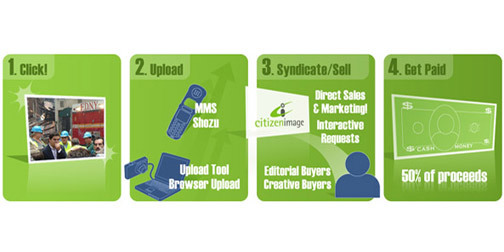 If you are a photographer (amateur or professional) you should check out Citizen Image. They specialize in marketing and selling the rights to photographs. Photographers can upload images they wish to sell and Citizen Image will help find a buyer. There is no fee to post photographs and photographers receive 50% of the gross proceeds from the sale of their photo. Buyers can search through the unique content online. If there are no appropriate images, buyers can set an Assignment for photographers, outlining the image(s) that they are looking for. This is a really well thought out system that benefits everyone involved.